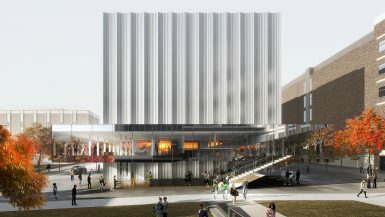 News | Unveiling of the Brown University Performing Arts Center designed by RE X | Front Inc.
We are excited to announce the public release of the Brown University Performing Arts Center designed by REX! Front has been an integral member of the IPD Design Team by leading the Facade Cluster and collaborating with the project team for all exterior enclosure systems as well as many specialty interior glazing and operable partition systems. The facade features two primary systems: a fluted, extruded aluminum rainscreen and a frameless mirror coated, high performance glass curtain wall system. We look forward to the continued collaboration with the project team. The University’s target date for completion is 2022. 11 July 2016Forget Beanbag Chairs. Amazon Is Giving Its Workers Treehouses.